What’s this guy’s problem anyway? Can’t he just leave these kids alone? Also! Congrats to Erin and Diana, woo!! Hello! I’m going to be changing Say Something’s update schedule just a little bit. Starting today new pages will be posted every other Saturday. This does mean that there will be no new page today. I’m sorry for the short notice, but I thank you from the bottom of my heart for reading my comic! Last week was the ending of Chapter Three, which is a huge milestone in my book! And it came at a fairly good/weird time. My job is becoming very hectic due to the holiday season and I now work 11 hours Sunday/Monday and 8 hours during the rest of the week (barring weekends). This schedule will likely stay this way until about the middle of January. It’s a physically demanding job and I come home very tired but I do try and work on upcoming pages. Right now I’m six pages into Chapter Four and it’s fully scripted! However, with the pace I’m finishing pages I’d have to put Say Something on hiatus in the very near future anyway. I figured it’d be better to begin the hiatus once a chapter ended rather than pause in the beginning of a new one. I don’t plan on Say Something having a year-long hiatus like last time. I’m not reworking chapters, I’m not redrawing anything, I’m just moving forward. At best, I want to return to weekly updates in late February, but I don’t want to make any promises. Over on my Patreon you can see fun facts for Say Something every other Friday by pledging only $1 a month! They will slowly become public starting January 11, 2019. Plus if you pledge $3 a month you can request monthly sketches! Don’t forgot that you can follow me on my twitter for news and sketches if I manage to put them out during this time! Those who have been following me know that Say Something has been on hiatus for quite some time now. With a lot of help over these past few months, I am back and better than ever! Chapter One got a total makeover, Chapter Two got quite a bit of a rework, and Chapter Three is well on it’s way to being finished. Updates will follow much the same as I have done in the past: one page every Saturday. Because Chapters One and Two were already published online, pages from them will come once a day starting Saturday, February 24! But once it hits Chapter Three they’ll go right back to Saturday updates. I’m also a part of the Wool Wolf webcomics collective! 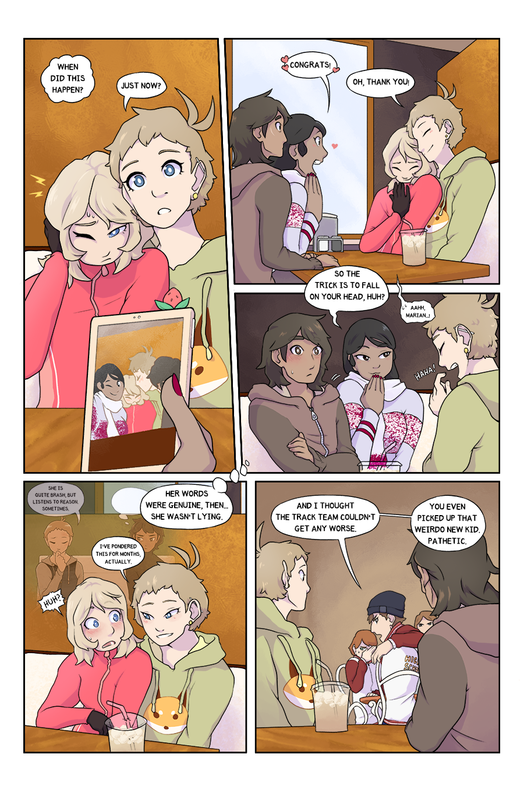 I encourage you to read my friends’ webcomics; there’s a bunch to enjoy! Thank you to old readers and new readers alike.